You could say the first shoe in this series wasn’t exactly pleasing to the eye, but don’t let its looks fool you, the first VS Athletics weightlifting shoe was a very well designed lifting shoe, “but then came the complaints about the aesthetics”, so they pulled the old shoe and released version II, what they did is put all the good stuff of the old shoe in the new one and tweaked the looks a little. And what you get now is a good looking weightlifting shoe for serious lifters. The VS Athletics weightlifting shoe II is one of the best shoes you are going to be able to pick up in the $100 price bracket. Looks aside ( personally I don’t mind the looks of the version II shoe) this shoe does just what it is designed to do, it’s optimized for propelling the weight upwards and with a solid 1.4″ heel raise they’re certainly going to help you do that. Great for Oly lifting but for deadlifts, you will need a flatter heel. 2 "Hook & Loop" straps over laces for added support. Designed primarily for Oly lifters, the 1.4″ heel height will still be ok for squats, these shoes don’t have to just be for the clean and jerk Oly guys. Us bodybuilders can make use of them too. Most bodybuilders or regular gym goers who aren’t into powerlifting or Oly lifting are usually training in a compressible heel. A compressible heel does not provide you with a stable platform and absorbs all of the initial force you intended for the weights, for legs day you need a shoe that’s going to aid you in propelling the weight upwards in the most efficient way possible and to help achieve proper alignment and adjustment. And for that, we need a shoe that has a solid incompressible heel. It’s a good idea if you’re a bodybuilder, especially when it comes to leg day, to get hold of a dedicated shoe for squatting. There are 3-4 pairs of excellent low priced squatting shoes, VS Athletics being one of them, which can make having a separate pair very affordable, the benefits certainly outweigh the cons(price). If you can grab a pair for around the $100 mark then it’s something your definitely not going to regret. Whilst many of us love to see a wooden heel I’m afraid at this price you’re not going to see one, the VS Athletics shoe incorporates the TPU solid plastic heel. TPU heels have been around now for a while and a well-made pair of shoes with a TPU heel should not have any compression issues at all. TPU heels are a much better option than the EVA type heels you see on shoes such as the Adidas Powerlift 3′ and many other cross-training shoes. Most serious lifters will avoid EVA heels because there are some slight compression issues under very heavy loads, also the durability of the EVA is questionable. TPU is proven to be as good or better than a wooden heel. TPU is not only an affordable option for the shoe producers, it’s also a durable one. If you lift heavy always go for a TPU or wooden heel. Lifting shoes are a long-term buy, they should last a few years and the one thing leather does over years of use is stretch, synthetic leather tends to stretch less and helps keep the original fit of the shoe. The VS Athletic shoe is a mix of synthetic and mesh, the mesh is around the top of the ankles and tongue of the shoe, they have got rid of any mesh in the side of the shoe as they had in version one, which is great for achieving looks but with no mesh in any part of the shoe where your feet tend to sweat the design has its first flaw. We need some air getting in somewhere… there are a few little holes in the toe area of the shoe which helps somewhat. A nice ridged rubber sole of the shoe will keep your foot from sliding. 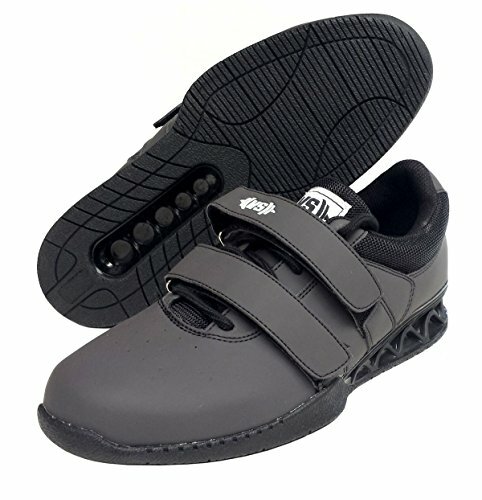 Most lifting shoes you come across have a single strap, which is typically found across the top the of lifting shoes’ tongue. The main reason the single strap design is at the top of the tongue is that it helps give extra security for ankle mobility in the squat. If you like extra security, the VS Athletic weightlifting shoe has the two straps similar to the Reebok legacy shoe, the straps are positioned at the lower and upper part of the tongue, giving you a more overall feeling of security and tight fit. For our choice of alternatives, I’ll assume you are looking for weightlifting shoes in the same price bracket as the VS Athletics. Here are two of the best weightlifting shoes we found to rival the VS Athletics. The Pendlay Do-Wins are an excellent 2 strapped pair of shoes, precision made and tailored specifically for the weightlifting community. There was no shock here to see a top quality pair of shoes from Pendlay, after all, they make some pretty impressive bars and plates so why should their shoes differ in quality. The two strapped shoe comes with the standard 0.75″ heel, which works well in most strength scenarios, just like the VS Athletic shoe the heel is made out of TPU so no compression issues. Pendlay is known for their wide toe box areas, which is a good thing but something important to remember is, if you have a narrower foot you may want to order half a size down to achieve the snug fit. A great choice of shoes if you are looking to get serious about your lifting. A fantastic pair of lifting shoes from the reputable footwear specialists Asics, a single strapped pair of mid-height, mid-weight lifting shoes. TPU heel, synthetic upper and breathable mesh make this shoe appealing to most lifters. What’s noticeable about the Asics heel is the drop, there’s no sudden step down like you get with Nikes Romaleos, the Asics have a gradual decline. Asics are another lifting shoe with a spacious toe box, Asics have given the Asics shoe a slightly more flexible feel which is mostly felt in the toe box. The flexible toe box gives this shoe its cross name, the flexibility in the toe box is really the only specification that can give this shoe the cross-branding. It has a solid raised 0.75″ TPU heel and they are in my opinion, best suited to platform. Summary Keenly priced and they need to be, with shoes such as the Pendlay Do-Win and Nordic Powerlifting shoes hovering around the same price bracket, it seems great to me that you can find a lifting shoe made to high quality for a $100, there isn't much difference here compared to shoes twice the price.It's a tough decision which shoe to buy in the $100 range but the VS Atheltic weightlifting shoe is doing its best to fight for top position.